La Church of San Gottardo in Corte at the Palazzo Reale it is a place of Catholic worship located in the historic center of Milan; it is part of the route of the Great Museum of the Duomo of Milan. In the current aspect, the church maintains the old fourteenth-century structures, but needs of representation in the eighteenth century sacrificed the facade and atrium in front of the church against the staircase of honor of the Palace in the years between the 1771 and 1775. Access to the church on the southern flank was opened and the portal was initially transferred to the Castello Sforzesco. At the beginning of the twentieth century, with the intervention of Luigi Perrone and Calzecchi Onesti, the neoclassical intervention was removed on the side, the brick was brought back to view and the original portal was reassembled and the overhanging oculus still leaning against the staircase. of the clay decoration. On the bell tower was installed the first public clock in the city that originally scanned 24 hours from the first hour after sunset. A tolling of the bell marked the first hour of the night, while at sunset the tolls were twenty-four (the operation of the clock is described in detail by Fra 'Galvano Fiamma, chronicler of the time). The time and the automatism of the mechanism caused such a sensation that the surrounding area was called "Contrada delle Ore". 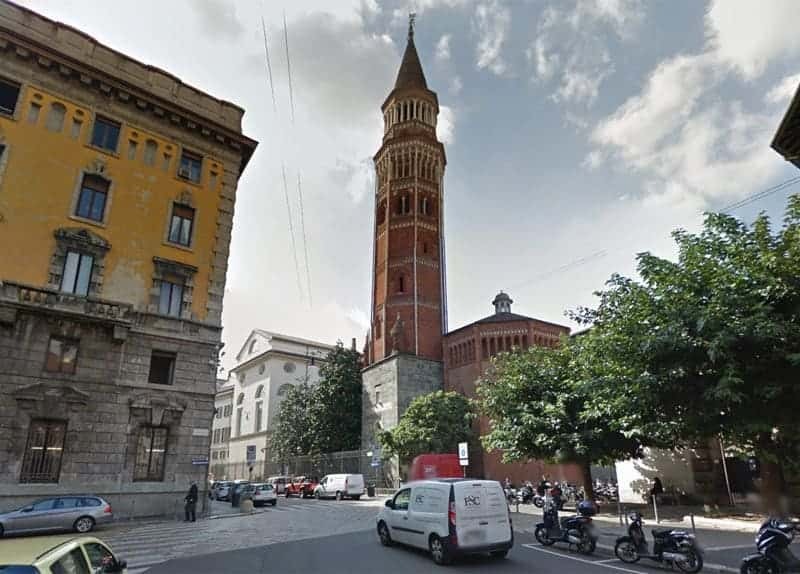 The tower was in the 1887 object of an important restoration intervention under the direction of Luca Beltrami. The interior of the church is in neoclassical style, the result of interventions of the late eighteenth century. The plan of the church consists of an elongated hall consisting of a single nave of three bays, of which the last one narrows to make place symmetrically to the sacristy and the bell tower, placed on its sides. The vault, frescoed, is sailing in the first two bays, to cruise in the last. In the middle of the nave, two shallow side chapels open symmetrically, each of them containing a polychrome altar: the left one is surmounted by the canvas Maria Assunta in the sky by Giuliano Traballesi, while the one on the right by San Gottardo Bishop of Martin Knoller. A deep forepart is placed at the nave; below the choir, which is supported by two rows of Ionic columns, on the wall of the counter-façade there is a fourteenth-century fresco depicting the Crucifixion, of the Giotto school; this was found in the 1929 on the base of the bell tower and suffered rapid deterioration up to 1953, when it was removed from its original location, restored and placed on the wall of the counter-façade. In a niche of the forerunner, there is the altar of the Madonna dei Dispersi, a silver copper work by Romano Rui. The apse ends with the polygonal presbytery, covered by an octagonal dome with lantern. The three polychrome windows giving light to the environment were created in the 20th century and depict stories of the Benedictine and Dominican religious orders. Close to the central wall is the high altar in polychrome marble, originally surmounted by the painting by Giovan Battista Crespi, known as the Cerano San Carlo Borromeo in Gloria. On the left wall, the sepulchral monument of Azzone Visconti has been recomposed; it was dismembered at the end of the eighteenth century and ceded first to Count Anguissola and then to the Trivulzio, who donated it to the church in the 1927. Been Church of San Gottardo in Corte or did you have the opportunity to visit the place as a tourist? Civic Planetarium Pearson Education, Inc.